Any time I have ever dealt with anyone at Summerwind, they have been extremely nice and helpful! We enjoyed our stay, which was our third vacation staying at Summerwind, and while we enjoyed our condo, the furniture wasnt the best, but we understand it may be hard to keep the best things in rental properties, we just struggled a bit with comfort during our stay with the living room and dining room furniture... other then that it was great! Your staff was helpful every time I needed assistance. We had a wonderful week and plan to visit again. Our condo was nice, clean, and spacious. The view was BEAUTIFUL! The decorations were nicely done. We had plenty of room to be comfortable. The staff is always welcoming, helpful and efficient. The view in this unit was incredible! Nicely decorated with all amenities needed and then some! Very pleasant and professional of the staff. Nice location, enjoyed staying in the condo. Everyone on staff from the funny lady who checked us in to the maintenance worker pulling crabs out of the pool first thing in the morning were friendly and helpful. Thank you! We have stayed in Navarre before and came back for the beaches and local restaurants. 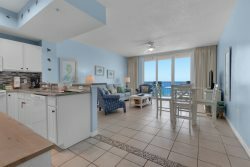 We found Navarre properties while looking for our condo and were very pleased with the quality and price. Everything was up to par. We will be returning next year and we are already counting down. Everything was provided and in home, only needed bracelets, young lady was a sweetheart. Check in begins at 3pm and rooms are guaranteed by 5pm. Please be sure to have alternate plans in case you arrive before your unit is ready.